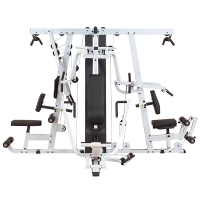 The Bi-Angular press arms of the G6B guide you through the optimal natural range-of-motion while applying resistance from two directions simulaneously. 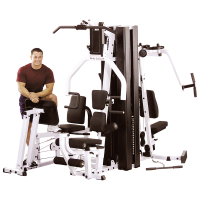 This smooth, fluid, multi-directional resistance system automatically produces 25% more muscle interaction by eliminating the ability to rest your chest muscles. 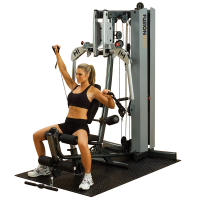 The G10 series of gyms features a multi-function press arm station for bench press, incline press, shoulder press and chest supported mid row exercises, Leg Stations, and the Perfect Pec Station. 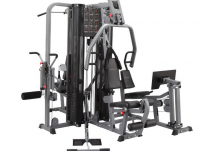 6 Station Gym for both your home and light commercial fitness center. 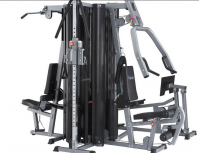 Body-Solid's Fusion 400 Functional Trainer is designed to do something no other functional training gym does: expand the user's anatomical planes of motion by engineering a revolutionary new press arm and pulley system with isolateral 250 degree pivots for unmatched versatility and function.